A gas or woodburning Fireplace Insert fits into an existing open woodburning fireplace. To enable installation of a fireplace insert, the existing woodburning fireplace must be a “regulation, code-conforming, woodburning fireplace”. No chimney: Occasionally, upon closer examination, homeowners discover that the fireplace in their older home is a façade only. Since they don’t really have a fireplace, a new fireplace construction is required. A full brick or stone chimney: You have a traditional, built-on-location, masonry (brick or stone) fireplace. You can likely install an air-tight woodburning or gas fireplace insert into it. A stainless steel chimney: You likely have an open woodburning zero clearance fireplace. It may be disguised with brick veneer or faux masonry to look like a traditional masonry fireplace. You can likely install an air-tight woodburning or gas fireplace insert into it (dependent upon the unit chosen). A gas or woodburning Zero Clearance Fireplace is a firebox unit used when constructing a new fireplace. 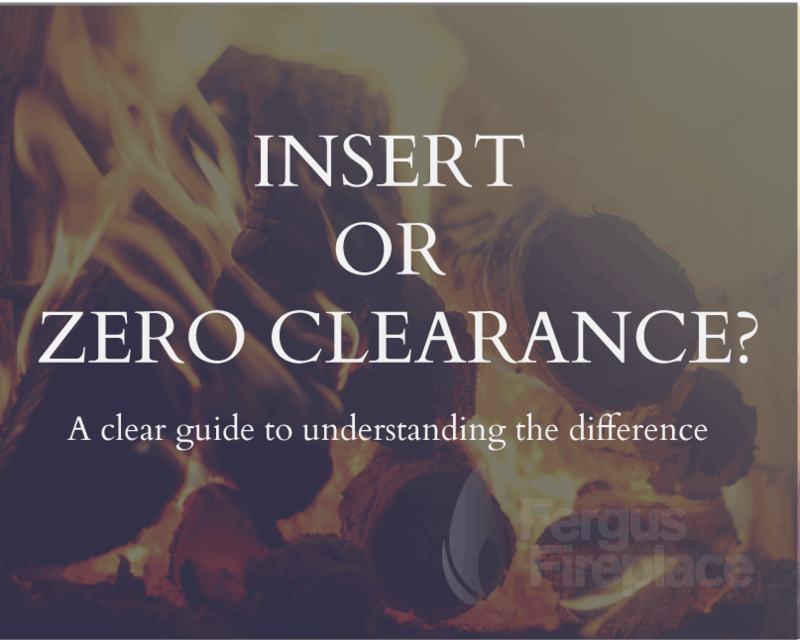 Zero Clearance Fireplaces are sometimes called “Factory Built Fireplaces” because they are pre-fabricated in a factory and then installed, not constructed on location like traditional masonry fireplaces. Zero Clearance means that the sides, top and back of the unit create a fireproof box. These units have minimal clearance to combustible surfaces. So, once installed with a chimney against a wall or in a “bump out” addition, and based on the specified clearances for the unit chosen, it can be surrounded by cement board, drywall or other finish (as specified by the manufacturer’s listed instructions). Chimney: A new zero clearance fireplace requires installing a full chimney, usually made of stainless steel, to enable the smoke to rise up and escape from the unit and your house. Venting: A new gas/propane zero clearance fireplace requires either a direct vent rigid pipe, flex pipe—double walled—one within the other. One pipe brings in fresh air and the other exhausts from the unit, pending manual from manufacturer listed instructions. Still uncertain? We’re here to help! Contact us today!